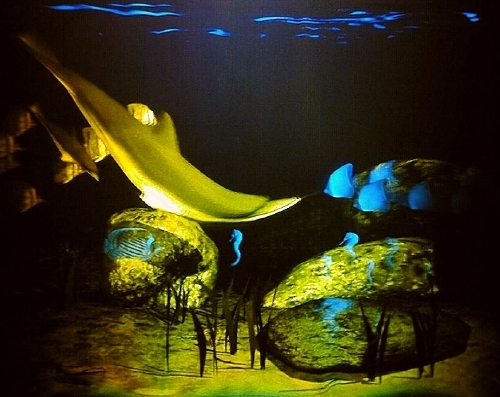 Every photo and animation on this list was made directly from a finished hologram. Full payment in advance, including packing and shipping. Holograms guaranteed for 1 year against defects in manufacture. Percentage discounts on bulk purchases. Factory seconds up to 50 percent off when available. Call for details. Simple lighting instructions accompany each hologram. 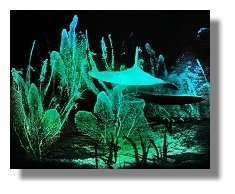 Early in the summer of 2009, HNI pioneered a new full color hologram printing process. We can now produce brilliant, clear full color, with improved color registration, far more quickly. 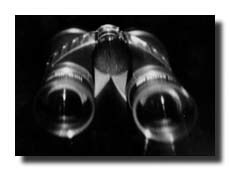 This allows us to reduce the price of full color for most imagery. 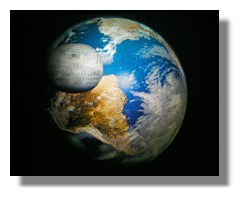 We now offer our popular Earth and Moon hologram in a slightly smaller size, with the improved color rendition. 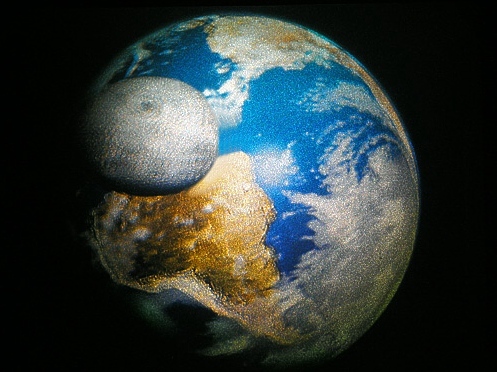 Originated from NASA imagery, this hologram shows the rarely seen back side of the moon, as it passes several meters in front of the rotating earth. Intriguing features such as sunlight reflected off the oceans and snow along mountain ranges are also visible. 18" x 22" (46 x 56cm) Full color transmission - $1150. 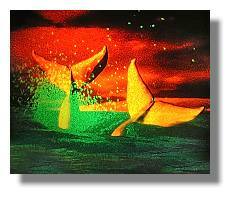 Now available in a reduced size and lower price, these whales dive into the ocean as you walk past, producing undulating waves and a dramatic spray of water droplets. 18" x 22" (46 x 56cm), 2 Color Animated Transmission - $1150. The Cassini spacecraft has orbited Saturn for several years, yielding discoveries such as water geysers on Enceladus and nitrogen lakes on Titan. 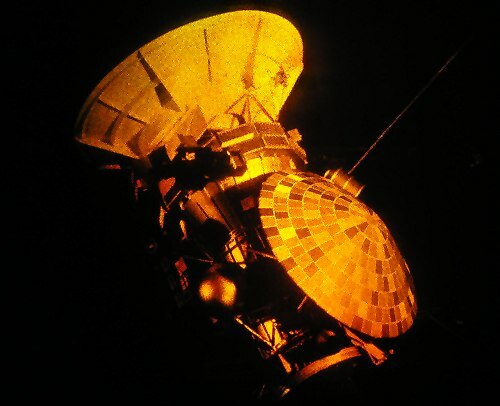 Aboard Cassini was the European Space Agency's Huygens Probe, separating in orbit to plunge through the thick atmosphere of Titan and soft land on its surface. 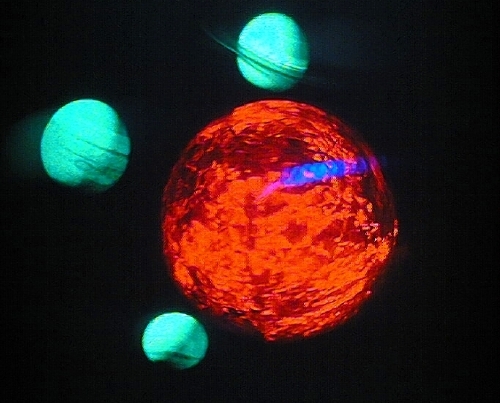 Produced from a model supplied by the Jet Propulsion Lab, this remarkable hologram shows a number of different views of the craft, climaxing in the animated separation of the Huygens probe. We now make it available in a smaller size. 18" x 22" (46 x 56cm) transmission - $950. 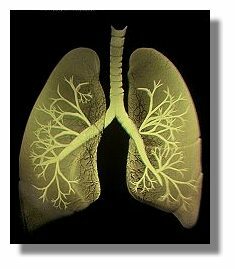 These human lungs actually breath with subtle animation as they spin through a full 180 degrees. 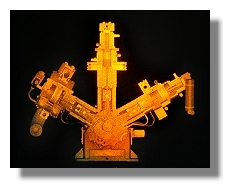 Our new transfer process makes this image nearly black and white when illuminated with the usual white lamp. 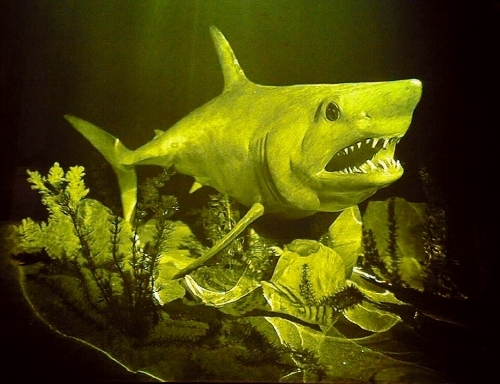 Alternatively, a single color LED or filtered lamp yields a vibrantly bright and clear monochromatic image. 18" x 22" (46 x 56cm), Achromatic Transmission - $950. 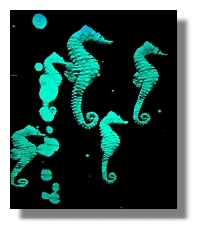 A school of elegant seahorses floats majestically past, as several columns of bubbles rise rapidly through the water. 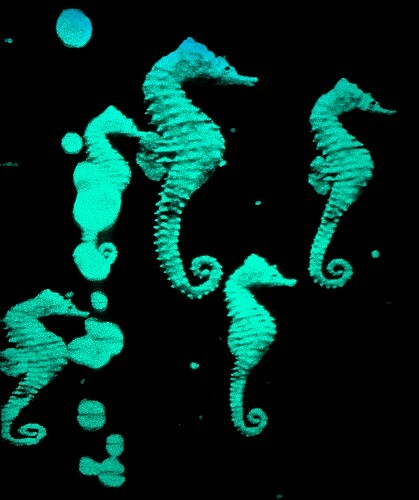 Very fine detail, and if you look closely as you walk past, you will see the seahorse fins working to gain propulsion. 18" x 22" (46 x 56cm), Animated transmission - $950. Our original skates hologram is so impressive, that we are offering a smaller, simpler version at a reduced price. 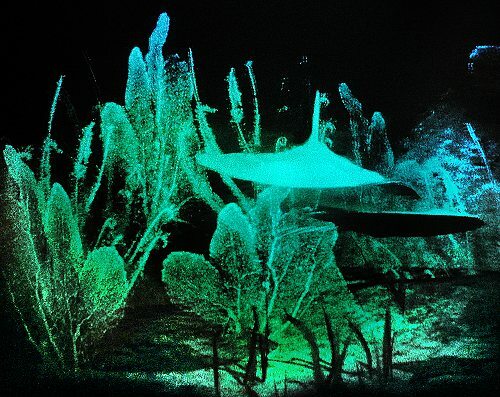 These marvelous creatures fly playfully toward you through a forest of highly detailed fan coral. 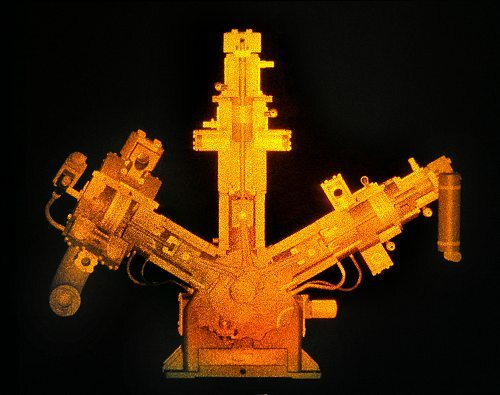 Machines have been popular subjects in our holograms, and so we have added this beautiful compressor to our library. The pistons slide gracefully in their cylinders as you walk past. A cubic volume of the universe is shown, 300 million light years on a side. The bright areas exhibit dense concentrations connected by stringy structure. They represent the distribution of "dark matter", recently discovered to be far more plentiful in space than visible matter. Image projects 14" (36cm) forward and 30 inches (76cm) back. Data from Los Alamos National Laboratory. More details on our What's New page. 38" x 33" (96.5 x 83.8cm), 1 Color Transmission - $1,600. The earth spins on its axis and the moon orbits 60 inches (150cm) in front, against a deep star field, in this full color animation. 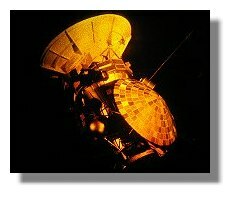 Modeled from actual spacecraft imagery, including the rarely seen back side of the moon, taken from Apollo photographs. This is the original, larger version of this image. 34" x 26" (86.4 x 66cm), Animated, Full-color Transmission - $2,500. Two galaxies swirl together in collision, amid a deep field of multicolor stars. 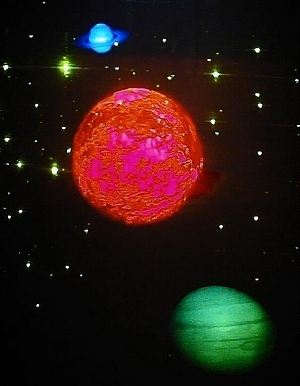 Computer generated animation from actual astronomical photographs. 24" x 18" (61 x 45.7cm), Animated Transmission, can be front lit and framed - $1,150. 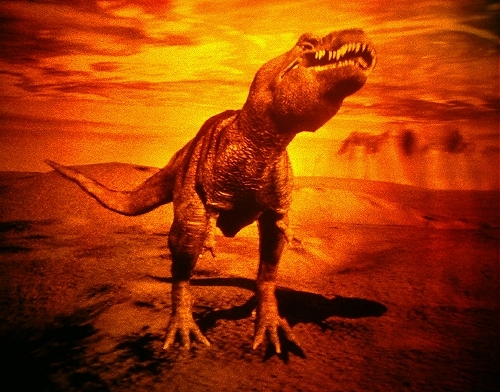 Swinging his head and tail, this creature steps over cratered terrain under a primitive, cloudy sky. 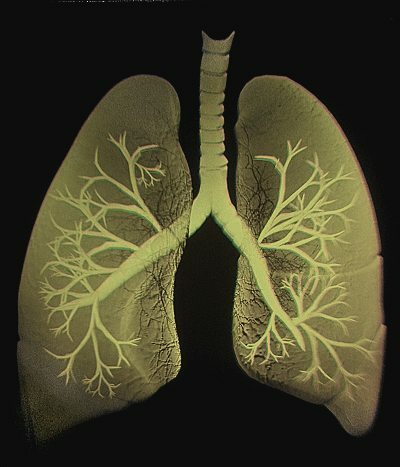 The computer animation features smooth, rapid movement, tremendous image depth and fine skin detail. 36" x 30" (91.4 x 76.2cm), Animated Transmission - $1,600. (NEW FORMAT) Now also available in the smaller size of 23" x 19" (58.4 x 48.3cm) - $950. An active red Sun is surrounded by Saturn in the background and Jupiter in the foreground, against a deep star field. 32" x 40" (81.3 x 101.6cm), 3 Color Transmission - $2,400. This flying dragon is not animated, but extremely sharp and clear. 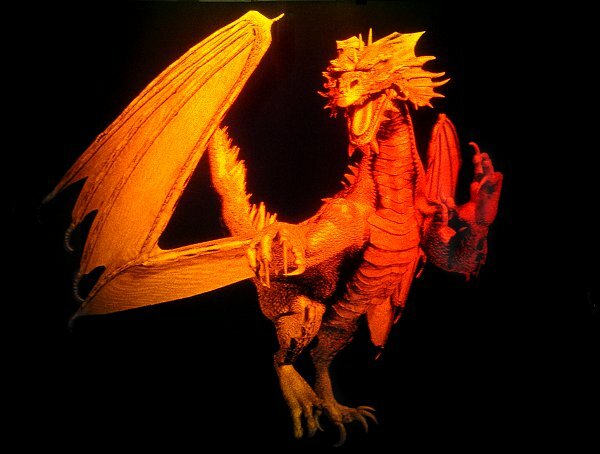 The tail extends 2 feet behind the hologram, and the claws are 8 inches in front. He's a beauty. 23" x 19" (58.4 x 48.3cm) transmission - $950. 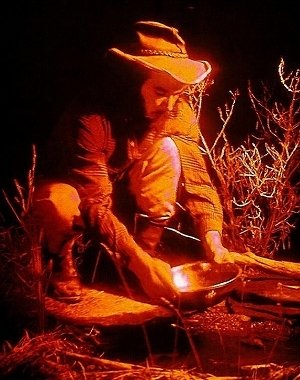 A miner pans for gold and searches for a nugget in this highly animated image. Fine detail in clothing and stream-bed scenery. 18" x 22" (45.7 x 55.9cm), Transmission - $950. 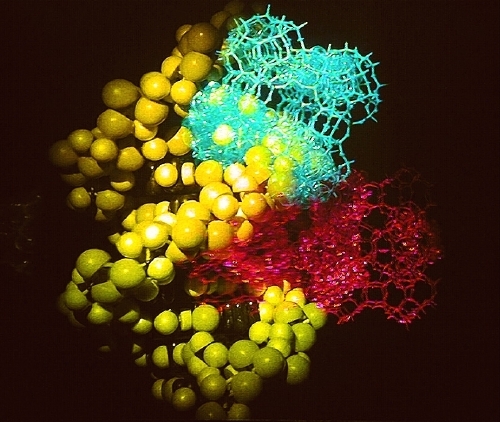 Full spiral DNA model seen from the left, joined by a multi-color group of Zeolite molecules as the viewer moves to the right. 36" x 30" (91.4 x 76.2cm), 4 Channel, 3 Color Transmission - $2,200. 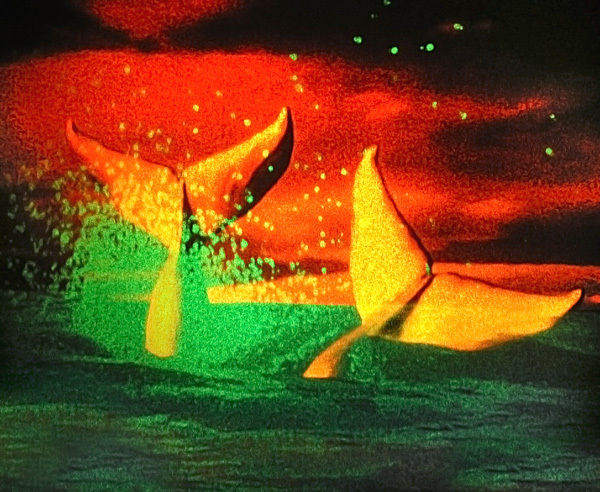 Stars of different shapes and colors float up to twenty feet out front. Fast image movement as the viewer walks by. 30" x 40" (76.2 x 101.6cm), Multi-Color Transmission - $2,600. Saturn, Jupiter, Venus, Earth and Moon revolve around a huge, boiling Sun, and a tiny blue comet streaks by, two meters in front. 34" x 28" (86.4 x 71.1cm), 3 Color, Animated - $1,900. 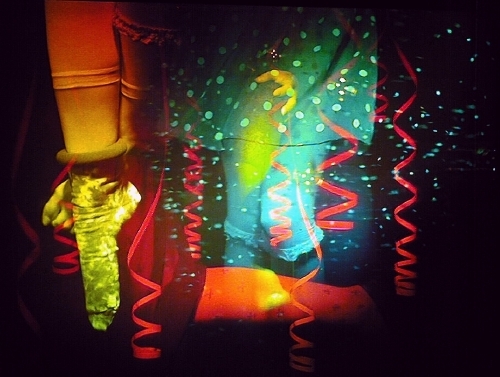 Women's legs in fashion leg wear with bubbles, ribbons and confetti, changing constantly as the viewer moves. This is a gorgeous, playful image. 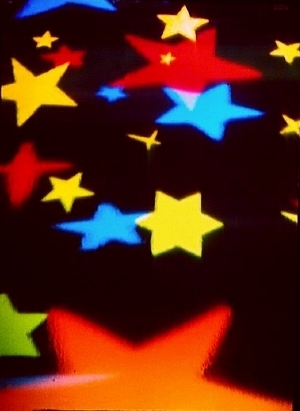 One collector called it the "best hologram" he had ever seen. Leg wear by HUE. 42" x 32" (106.7 x 81.3cm), 22 Channel, 3 Color Transmission - $2,200. 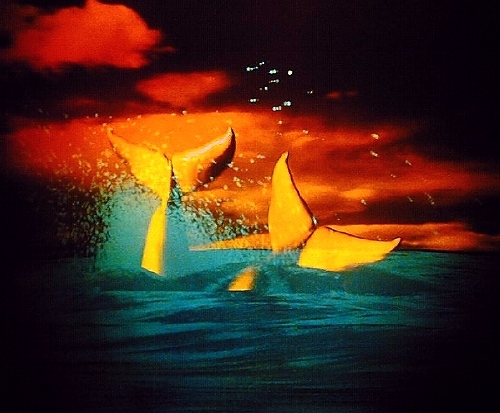 Water splashes and waves roll as two whales disappear into the ocean. Vector calculated, computer generated animation. 38" x 32" (96.5 x 81.3cm), 2 Color, Animated Transmission - $1,900. The Cassini spacecraft, with Saturn and Titan in the background. 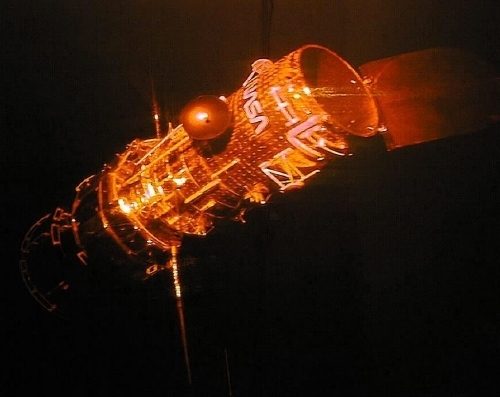 The protective shields disappear, the main engine cover opens, and the Titan probe separates from the craft. 30" x 40" (76.2 x 101.6cm), 3 Color, Animated Transmission - $2,400. 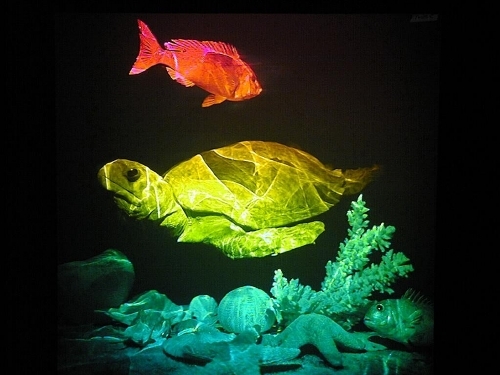 A giant sea turtle is seen in two different positions, surrounded by fish and coral. 38" x 32" (96.5 x 81.2cm), 2 Color, 2 Channel Transmission - $1,900. A swooping school of skates flies through a forest of fan coral, and a lazy hammerhead shark watches under the glittering ocean surface. 38" x 32" (96.5 x 81.2cm), 2 Color, Animated Transmission - $1,900. 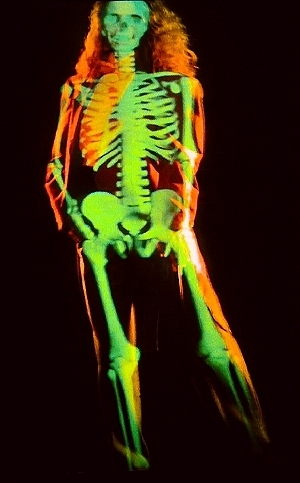 A woman dances in white tie and tails, accompanied by the skeleton inside her. 30" x 41" (76.2 x 104.1cm), 2 Color, Animated - $2,200. 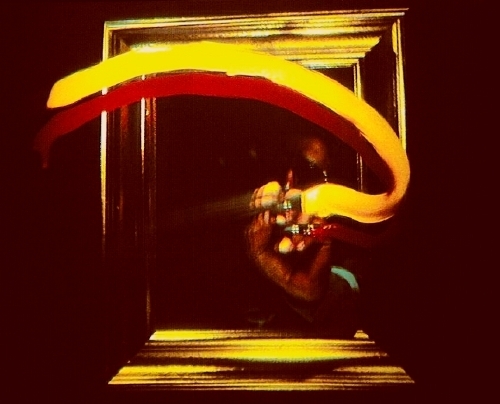 An artist reaches through a gold frame with two brushes, loaded with yellow and red paint, and paints in space a foot in front of the frame. Very fast animation. 30" x 26" (76.2 x 66cm), Full Color, Animated - $2,200. 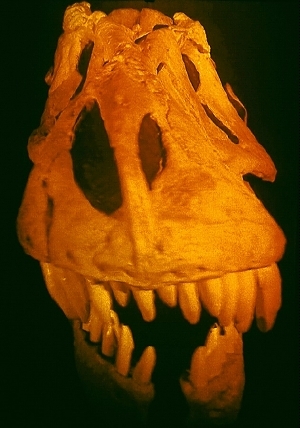 Life size (4' long) dinosaur skull sports fantastic teeth two feet in front of the hologram. Fossil cast by the American Museum of Natural History. 30" x 42" (76.2 x 106.7cm), Transmission - $2,200. 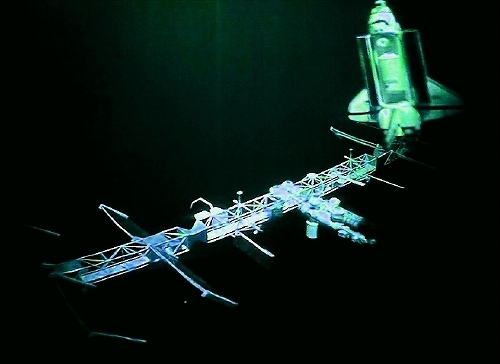 Historic model of the U.S. "Freedom" Space Station with shuttle hovering in front. Models from the Alabama Space and Rocket Center. 38" x 30" (96.5 x 76.2cm), Transmission - $1,200. Intricately detailed model provided by the Alabama Space and Rocket Center. 36" x 30" (91.4 x 76.2cm), Transmission - $1,200. 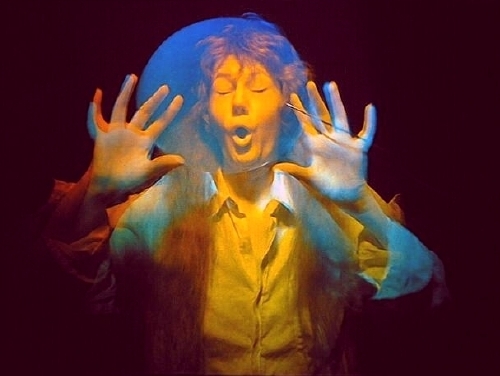 A woman blows up a balloon which becomes transparent, and then disappears as the viewer moves to the right. 38" x 28" (96.5 x 71.1cm), 2 Color, 2 Channel Transmission - $1,600. Mother and baby dive, twist and head back to the surface in a sea filled with fish, rocks and sand dollars. 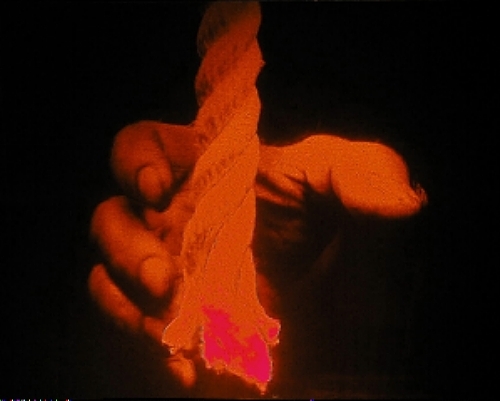 Strong, animated image of a giant hand opening, reaching forward and grasping a rope. 36" x 28" (91.4 x 71.1cm), Transmission Stereogram - $1,400. One live parrot replaces another, surrounded by blossoms and fronds. Slight head movements and eyes blinking. 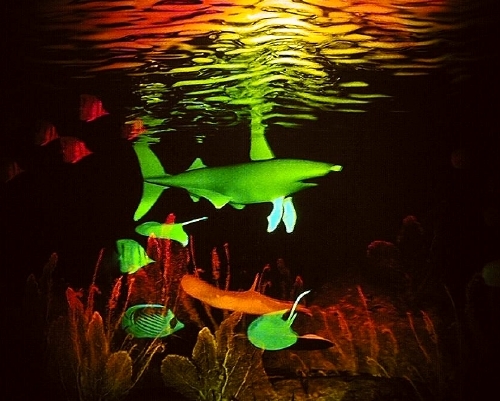 A six foot Mako swims in two images along the ocean floor with a myriad of sea life. Shark cast provided by the Niagara Aquarium. 38" x 30" (96.5 x 76.2cm), 2 Channel, 2 Color Transmission - $1,900. 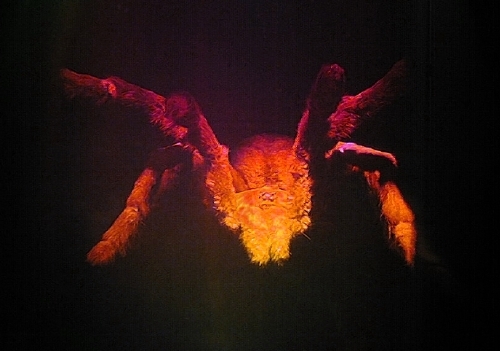 A 3 foot Tarantula moves across the film in five different poses, from crouch to strike. 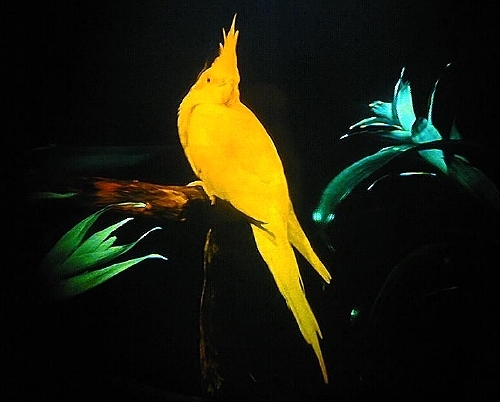 Model from the St. Louis Zoo. 58" x 38" (147.3 x 96.5cm), 5 Channel Transmission - $4,100. 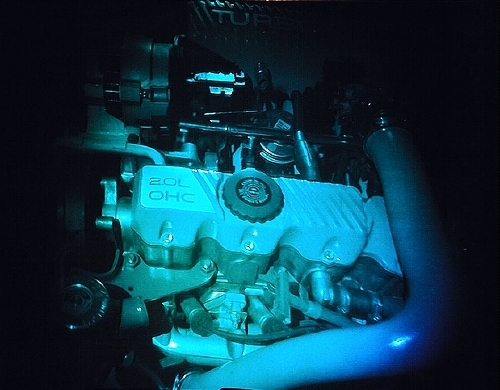 Late model four cylinder turbo engine by Pontiac. Stunning realism. 38" x 32" (97 x 81cm), Transmission - $2,200. 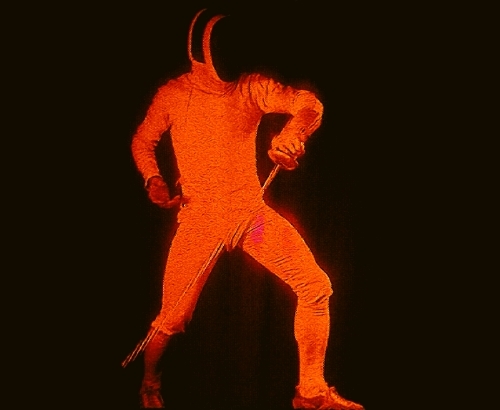 Rapid animation as the sabre is swept into a defensive stance. 30" x 24" (76 x 61cm), Transmission - $900. 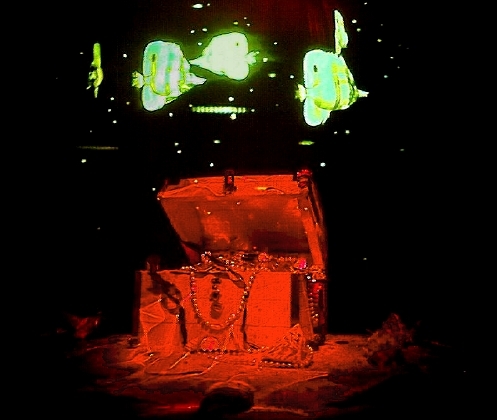 The chest is seen locked, and then open, draped with pearls, coins and other treasures, with fish circling above. 38" x 32" (96 x 81cm), Transmission - $1,900. 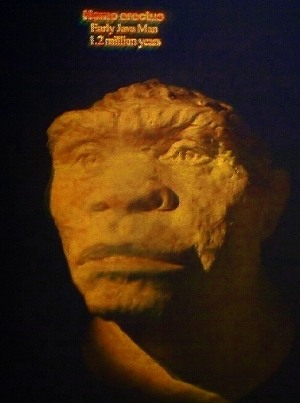 The evolution of Man's head is shown in five views, one replacing another, as you pass by. Models by the American Museum of Natural History. 11" x 15" (28 x 38cm), 5 Channel, Reflection - $1,100. Fantastically interactive! 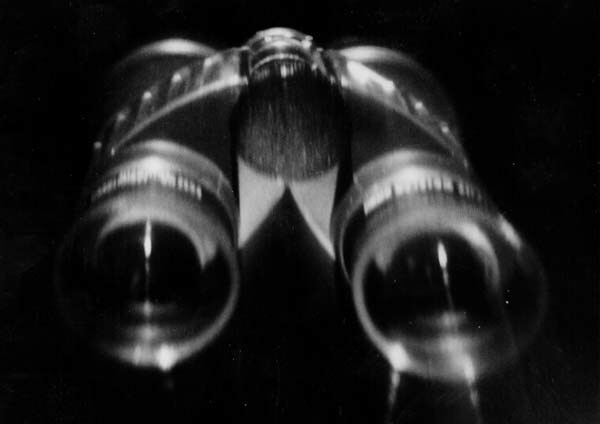 A distant dove can actually be seen through the eyepieces. 10" x 8" (25 x 20cm), Reflection - $800.